The city of Akhalkalaki is the centre of a historical region called Samtskhe-Dzhavakhetia located in the utmost southwest of Georgia. It is a high-mountainous area of subalpine and Alpine meadows with many crystal water springs and brine wells. The climate there is rather severe; in the winter the temperature can fall as low as – 40 С. This original frontier region greatly differs from other areas of Georgia. The climate is not the only difference. The region has its own history, culture, language and traditions. It is explained by the fact that earlier Dzhavakhetia bordering on Armenia and Turkey used to be a part of these states at different times. Until now the Samtskhe-Dzhavakhetia region is a dispute subject between Georgia and Armenia. That is why in the city like the entire region bears the traces of Armenian history and culture. Modern territory of Dzhavakhetia in different periods of its historical development was a part of different states. In the most ancient period this territory was a northern outlying district of the first centralized Armenia Urartu state (on the territory of Armenia). Then was a part of the Persian Akhmenid state. In the 2 nd century BC these lands were a part of Armenian Artashesid kingdom, and when the latter collapsed it was taken by Sasanid state (Northern Iran). In the Middle Ages the territory of Dzhavakhetia was within the structure of Georgian princedoms. In 1637 it was conquered by the Ottoman Empire , and in 1826-1828 it was annexed to the Russian Empire when Russian armies under the command of General Paskevich occupied Akhalkalaki. In 1830 30,000 Armenian refugees ran away from Turkey to Akhalkalaki. Therefore, Dzhavakhetia became a “little Armenia” in Georgia. The city of Akhalkalaki, according to historians, was founded in the 11 th century. In the 15 th century it was almost completely destroyed and in the 17 th -18 th centuries rebuilt by Turks and transformed into a powerful fortress. There are a lot of ancient monuments of Armenian architecture in Dzhavakhetia. In the vicinity of Akhalkalaki you can see a unique monument of global significance – the ancient city of Vardzia cut inside rocky mountains. 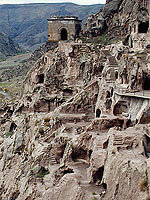 Vardzia is 18 km from Akhalkalaki right next to the border with Turkey. The city was erected in the 12 th – 13 th centuries during the rule of George III and his daughter of Tamara for the purpose of the southern boundaries of Georgia protection. Vardzia is not just a set of random rooms cut in rocks. It is a multi-storied (!) complex with streets, tunnels and stairs leading to monasteries, temples, fortresses, baths, libraries dwelling houses and so forth. All in all there are over 600 premises connected by passages which stretched along the mountain for as long as 800 meters, to the depth of 50 meters standing 8 levels tall. In case of an enemy attack the monastery turned into a fortress for inhabitants and could host up to 20, 000 people. Georgian soldiers could use three secret passages and defeat enemies with a surprise attack. The cave complex, besides protective, carried out spiritual function as a Christian monastery with the big temple of the Assumption of the Virgin. The temple still has the fragments of wonderful frescos of the 12 th century including the ones showing tsar George III and Queen Tamara. Some historians believe she was buried there. In order to confuse vandals 8 funeral processions went different directions simultaneously from Tbilisi. They arrived both in Gelati and Vardzia. In the 13 th century Vardzia suffered from a major earthquake (1283) when a 15-meter rocky slab fell in the Kura . 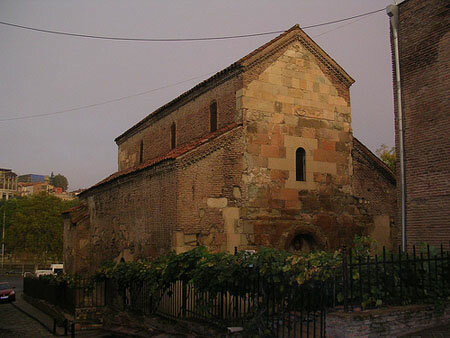 As a result the monastery lost its function as a fortress. Later Vardzia suffered from Mongol invasion in the same 13 th century, Iran defeat and Turkish yoke in the 14 th -17 th centuries – all those events led to the city’s destruction. In 828 Dzhavakhetia was liberated by Russians and life returned to Vardzia. During the Soviet period the monastic life in the monastery stopped and renewed only in the late 1980s. Today about 15 novices live in the monastery. 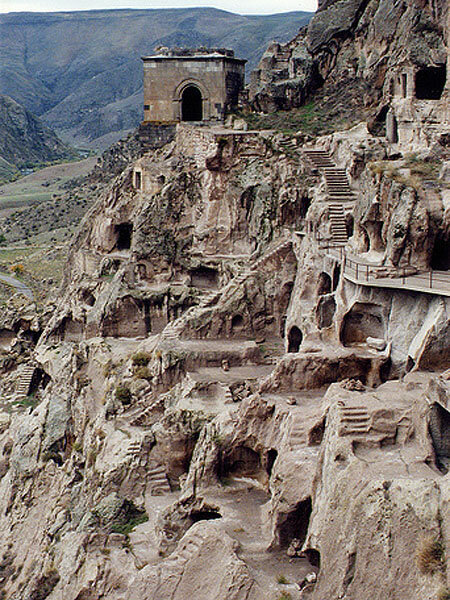 Since 1938 Vardzia has been a memorial estate. Several kilometers from Vardzia there are the ruins of the Kumurdo episcopal church located on a mountain slope. It is well-known for being the first historical monument created in the 1 st century AD. However, a lot of inscriptions are still found on the temple walls. One of them says that the temple foundation was laid “with the Divine help” during the rule of tsar Leon – the tsar of Abkhazia – in 964. Possibly, during this period the temple was seriously restored (and Dzhavakhetia was a part of Abkhazian kingdom in the 10 th – 11 th centuries). Other inscriptions on the walls tell about the construction of the southern gallery under Bagrat IV rule (1027-1072), and about the temple reconstruction in the 16 th century. The church roof, the drum-type dome and the entrance are badly destroyed. But the cruciform facade as well as the wall with arch niches (similar to Oriental mosques) o its right have survived.